Groovy, melodic, heavy; All Heed The Black God marks the arrival of Saint Karloff and fans of the fuzzy, distorted sounds of prime proto-metal and classic horror will get a kick out of these Norweigans’ jams! 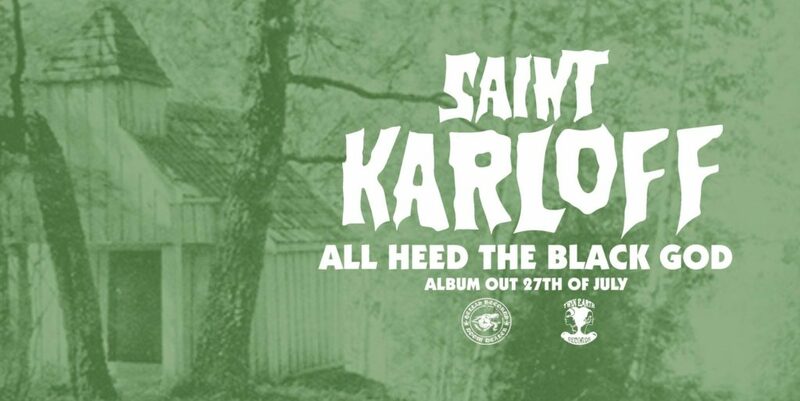 As you probably guessed, Saint Karloff are inspired by late 60’s and early 70’s hard rock/heavy blues bands such as Black Sabbath and early Pentagram, and their driving riffs, groovy beats – which all come with with a touch of modern day doom and stoner rock flair – transport you back to the halcyon days when ‘heavy’ music was still in its infancy. The whole thing is a work of sublime fuzzed-up beauty but there’s a few songs which require notable mention. “Space Junkie” rocks and howls like a muthafucker and misbehaves in a manner befitting its Ozzy fronting Blue Cheer veneer while instrumental “Ganymedes” recalls the pastoral brilliance of Necromandus. “Radioactive Time” is then the offspring of The Stooges meets the little known Crushed Butler and is a rumbling, clattering, percussive juggernaut. Simply outstanding, it’s an absolute, cast-iron, proto-metal classic in the making. All Heed The Black God will be released through Twin Earth Records July 27th, 2018 on digital platforms, vinyl, and CD. The album will also be available on cassette through Hellas Records. Bow down to the riffs of the Serpent Lord! Occult obsessed proto-metal from Florida! Figure in black, which points at me?